This comprehensive reading lesson is designed for small group Guided Reading instruction. The lesson could also be used as a whole class read aloud. The lesson plan includes a focused reading strategy, comprehension prompts, vocabulary building activities, graphic organizers, a quiz and writing activity. The activities provide concrete evidence of comprehension and vocabulary building. The lesson follows a before-during-after reading format and typically takes about 2-3 days for 20 minutes each day. The book is not included. Answer keys are included. 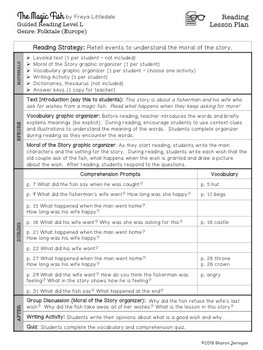 - Guided Reading Lesson Plan: Full lesson plan on one page. 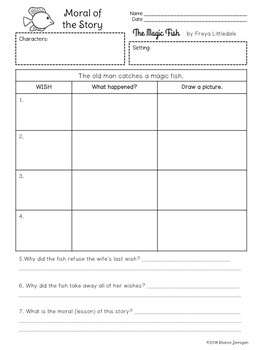 - Moral of the Story graphic organizer: Students identify the wishes made by the old couple, what happens after each wish is granted and draw a picture. Students answer questions to demonstrate their understanding of the moral (lesson) of the story. - Vocabulary Activities: Two options for graphic organizers. - Vocabulary Cards: For use with additional vocabulary games or activities. - Writing Activity: Students respond to the prompt by writing a short paragraph. Students cut and glue the paragraph into their notebooks OR glue to colored paper for display. - Vocabulary & Comprehension Quiz: Use after reading and group discussion. - Answer Keys & Writing Rubric/Checklist: Answers and point values provided. - Provide a brief introduction of the text and genre. - Introduce and explain Moral of the Story organizer and vocabulary organizer. - Optional: Explicitly teach vocabulary before reading. - Students read the text silently at their own pace. Listen and confer with individual students, use the comprehension prompts to help them think deeper about the story. - Assist students in determining meanings of words. - Discuss the text using the discussion prompts and graphic organizer. - Discuss vocabulary words and meaning as used in the text. - Have students respond to the writing prompt by writing a short paragraph. 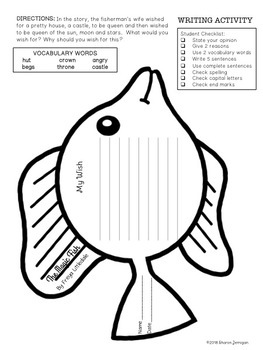 - Optional: Use vocabulary cards in a spelling, vocabulary or word work station. Freya Littledale is the author of more than 30 books. 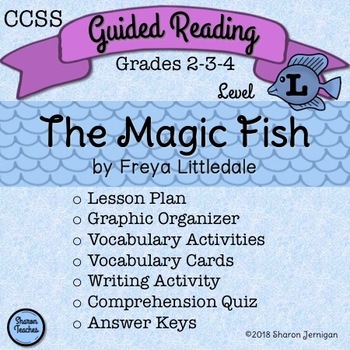 First published in 1967 (republished in 1992), The Magic Fish is a timeless tale of greed. An old fisherman catches a magic fish. His wife realizes that the magic fish can grant wishes. Students enjoy reading about the wife’s continuous demands for more wishes. The story provides a good opportunity for students to reflect on greed and what they would wish for if given the chance.